If you want an amp that not only sounds great but looks fabulous, too, our advice is to hurry - these Fender Special Editions aren't going to be around for long. Pure audio candy, aided by the Alnico Jensen driver. One of the best- looking combos we've seen in ages. While digital modelling and modern multi-function amps continue to be popular, there's a growing move back to vintage heads and combos, powered in part by a boom in high-quality outboard pedals with increasingly realistic valve overdrive simulations. "I just want a good basic amp, with a good drive pedal" is a request we're hearing all the time now, and what better place to start looking than Fender's catalogue, which has two ideal candidates in the shape of the '65 Princeton Reverb and '65 Deluxe Reverb reissues. This is truer now than ever, as Fender has just announced new limited factory special edition versions of both models, with enhanced cosmetics. Today, we take a look at the Deluxe. The Deluxe has a very attractive combination of Wine Red Tolex with a wheat grille and a regular black panel and handle. Both amps benefit from Jensen Alnico loudspeakers: a P10Q in the Princeton and a P12Q in the Deluxe. Front and rear panel layouts are quite faithful to the originals, with high-and low-gain inputs feeding volume, treble and bass controls, plus a level control for the valve-powered spring reverb and speed and intensity controls for the vibrato effect, which is actually a tremolo, of course. The Deluxe gets a second effects-free channel, again with two inputs and volume, treble and bass controls. As you might expect after half a century, the electronics are different. The originals were built up using eyelet boards, a rectangle of fibreboard with rivets stamped into it at strategic points into which the components are soldered, with a separate can on the top of the chassis containing all the main filter capacitors and a valve rectifier. The modern version retains the valve rectifier but uses single-sided printed circuit boards for all the small components - one large board holding preamp, power amp and power supply stuff, with ribbon connectors to two smaller boards that connect the front-panel inputs and controls. We're not generally big fans of this type of PCB for valve amps. However, on this model, Fender has handwired the valve base, keeping all the heat away from the board for much-improved reliability. As a result, there's a lot of wiring and soldering inside, and it's generally quite clean and tidy, with the valve AC heater supplies twisted and raised above signal leads to reduce hum. With so much hand wiring already inside this amp, it begs the question: why doesn't Fender go the whole hog and use eyelet boards, as it did with the originals? The amp uses a valve rectifier, and in common with all such designs, it takes a few minutes for the voltages to ramp up and stabilise properly. Plug in, and you're immediately transported back to Fender's golden years; this amp has the sugary sweet clean tone that's recognised all over the world as the classic 'blackface' Fender sound, with a less aggressive midrange than their earlier 1950s tweed counterparts, and an airy, multi-layered treble thanks to the characterful Jensen drivers. The amp delivers a thoroughly addictive tone that flattered every guitar we plugged into it. The low output wattage means they're easily pushed into overdrive, with a subtle edge at around six on the volume controls when used with a regular-output Stratocaster; slightly less when a Les Paul was plugged in. The Deluxe Reverb's bigger speaker and cabinet (compared to the Princeton) add up to a bigger sound - the slightly increased volume level and headroom mean the Deluxe is just right for pubs and clubs, and like the Princeton, its smooth cranked-up overdrive with just a hint of edge is perfect for blues, fusion, Southern rock... in fact, just about any American musical genre you care to name. The Deluxe Reverb's 12-inch speaker and 22-watt output power mean extra headroom and clarity, so it will retain definition a little better as volume rises. The valve-powered reverb is superb - noise free, with a huge range from soft ambience to full-on surf, while the vibrato/tremolo effect goes from deep, slow pulses to almost LFO territory. One small idiosyncrasy is the need for a footswitch plugged in on the Deluxe before the effects work. 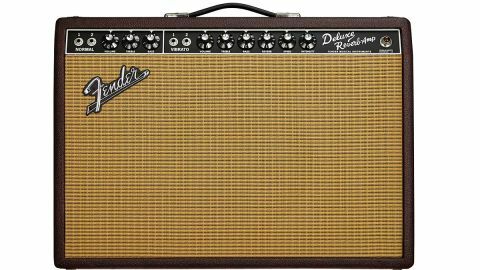 The Deluxe Reverb's 12-inch speaker and 22-watt output power mean it's the ideal companion to the guitarist playing small club and pub gigs: basically, the type of venue that most of us play in all the time.